Off-Broadway Cast, 1960 (20th Century-Fox/Stet) (1 / 5) When Stet picked up the rights to this long-forgotten revival cast album, it plastered the names of cast members Linda Lavin and Penny Fuller in big block letters on the cover, despite the fact that both were merely members of the chorus. On the other hand, Eddie Phillips, who has two big numbers, isn’t billed at all. There are missing songs, interpolations from other scores, and new, slapdash lyrics by Wodehouse; “You’ll Still Be There,” originally “Dear Little Girl,” doesn’t even scan neatly. The snatches of dialogue included here show a certain patronizing attitude toward the material, as if to say: “Look, it’s 1960 and we’re much smarter now!” The arrangements for an anorexic combo are cutesy, and the cast is uneven. David Daniels, his baritone as solid as ever, is a fine Jimmy, but his Kay, Marti Stevens, drifts in and out of her Mayfair accent. She also has the odd habit of speaking whole verses of her lyrics, though not for any lack of singing ability. 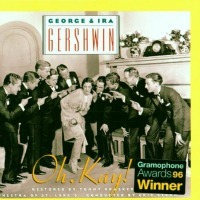 The recording is over in 36 minutes, and Gershwin’s melodic magic does survive the mishandling. It’s okay, but it’s not Oh, Kay! (The CD also includes selections from Leave It to Jane.) — M.M. 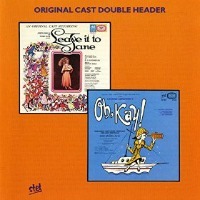 Studio Cast, 1995 (Nonesuch) (5 / 5) A sheer delight, this reconstruction of Oh, Kay! 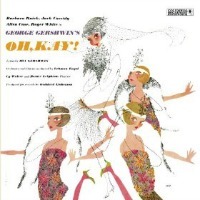 takes certain liberties: It has new orchestrations by Russell Warner, some of the songs are re-sequenced, and some cut material has been restored. Still, the recording is utterly faithful to its Jazz Age heritage. Dawn Upshaw’s Kay is fervent, girlish, whimsical, and miles away from the opera-house haughtiness that sometimes is displayed when crossover artists attempt the Great American Songbook. Her “Someone to Watch Over Me” is melting and persuasive, her “Maybe” is pensive and touching, and her command of musical theater vernacular is total. Similarly, Kurt Ollmann’s Jimmy is no opera snob slumming on Broadway; rather, he’s a chipper juvenile with a lot of voice. Other cast members — Robert Westenberg, Liz Larsen, and Patrick Cassidy (who rips through “Fidgety Feet”) — are stylistically perfect. There are some fun surprises, too: Susan Lucci pouts amusingly as Jimmy’s bitchy fiancee, and Fritz Weaver bloviates entertainingly as her pompous pater. Eric Stern’s 23-piece orchestra is just the right size for this score and has a clean, unaffected sound. Kevin Cole and Joseph Thalken tear irresistibly through some twin-piano arrangements. The handsome CD booklet contains informative, engaging notes by Lee Davis, producer Tommy Krasker, and Evan Ross. — M.M.